Goddess Bhadrakali is a fierce manifestation of Mother Goddess Shakti. 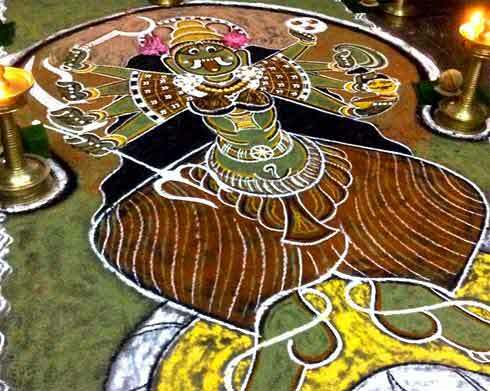 She is popularly worshipped in this form in Kerala and some parts of South India. Bhadrakali appeared from the forehead of Shiva to annihilate demon Darika. The story of Bhadrakali and Goddess Kali is different. The character and ferociousness of both the deities are the same but the story of origin is different. Bhadrakali is ferocious to those who practice Adharma. She is merciless to them. To those who practice Dharma, she is the kind mother. She is the protective mother who will never let any harm happen to her children. Legend has it that once Asuras, or demons, were defeated by Devas and they had to retreat to the netherworld. Two Asura women then did intense penance and propitiated Brahma who gave them the boon that they would give birth to two powerful sons. In due course of time, the women had two sons named Danavendra and Darika. Danavendra and Darika then did intense Tapas and propitiated Brahma. They attained the boon from Brahma that men, gods or demons would not be able to kill them. They also got the boon that they would have the strength of thousand elephants. With such invincible powers, Danavendra and Darika attacked the Devas and drew them out of heaven. Devas asked Sage Narada to help them. Sage Narada went to Kailash and asked Shiva to intervene and wipe out Adharma being propitiated by the demons. Shiva then opened his third eye and Goddess Bhadrakali appeared from it. This form of Mother Goddess Shakti was unimaginable. Devas or humans or demons had never such a ferocious Goddess. The colossal body of Bhadrakali was jet black. She had three burning eyes and her mouth was like a huge cave. Two long saber like teeth were projecting out from it. Her black hair rolled down like a tumultuous river. She had innumerable arms and each holding a separate weapon. It was impossible to look at her face. She went into battle against Danavendra and Darika. The demon army was no match to Goddess Bhadrakali. All of them were crushed and killed. Then Danavendra was killed. Finally, Bhadrakali chopped the head of demon Darika. Goddess Bhadrakali temples are found throughout Kerala. Goddess Bhadrakali murti are usually made of Dharu or wood. Puja and rituals are performed on a separate metallic bimbam. Temple festivals associated with the Goddess are observed throughout the year. The rituals vary from region to region. Goddess Bhadrakali is depicted with two, four, eight, sixteen, eighteen or 32 arms. The arms hold numerous weapons. She also holds the severed head of Demon Darika. 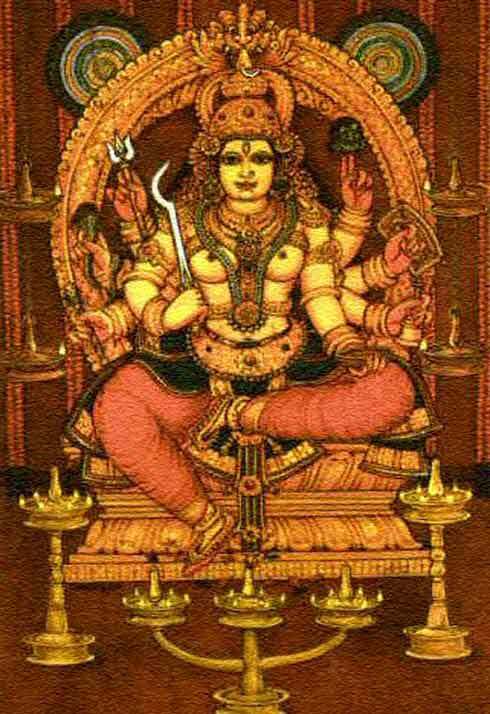 Tuesday and Fridays are the most auspicious days in a week associated with the Goddess. She is propitiated for early marriage; cure from diseases, peaceful life, and healthy children and for defeat of enemies.